This classic coconut cream pie is made with a delicious custard filling and topped with sweetened whipped cream and toasted coconut. In a large bowl combine pudding, milk, and extracts and stir until thickened. Fold in 1 cup of sweetened flaked coconut into the pudding mixture. Add 1 tsp vanilla and 2 tsp of powdered sugar to the whipping cream and whip until firm. Fold half of the whipped whipping cream into pudding mixture. Add pudding mixture into prepared crust. Top with remaining 1 cup of whipped cream and toasted coconut. Chill for several hours over overnight. Serve chilled. 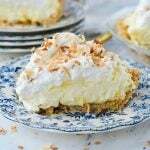 Coconut Cream Pie was originally written by Leigh Anne Wilkes at https://www.yourhomebasedmom.com/coconut-cream-pie/.